S-5! has published its 2018 Attachment Solutions & Products brochure and made it available for download. You can access it right here. 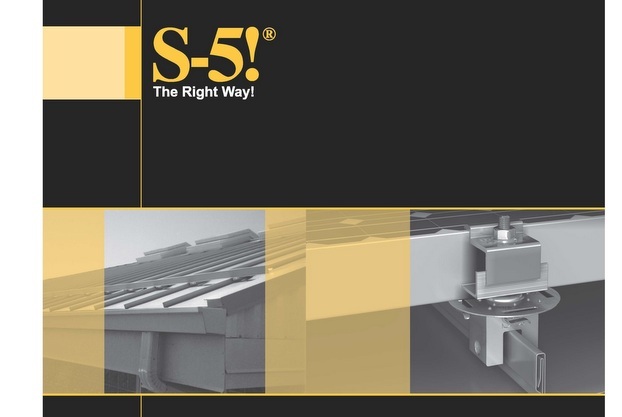 The Attachment Solutions & Products brochure contains information about what S-5! attachment products can be used for and how to correctly use them. The S-5! line of aluminum and brass attachment products are extremely versatile, fitting most standing seam and exposed fastener metal roof profiles, including most structural and architectural profiles. In the brochure, find solutions for attaching solar panels, snow retention systems, signs, banners, pipes and conduits, HVAC and rooftop equipment, satellite dishes, lightning protection, fall protection and more. Posted in: Green Building LEED News, Solar Power & Energy	| Tagged: attachments, Mounting Guide, News, Products, S-5!